During periods of inclement weather, it may be necessary to close the gardens for safety reasons. Dogs are welcome in the Gardens and nature trails but must be kept under vigilance at all times. At Pier is the closest bus stop. Can be reached on foot as well on a cycle. 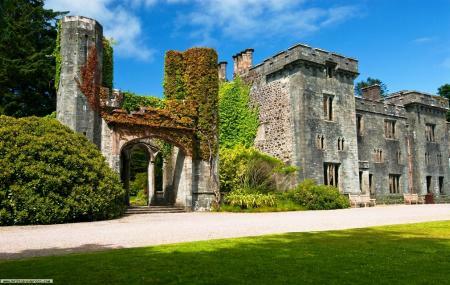 How popular is Armadale Castle? People normally club together Rubhaphoil Forest Gardens and Skyelark Gift Shop And Photo Gallery while planning their visit to Armadale Castle. We stayed in one of the lodges and it was lovely. Fantastic location. Even better views of the water and mountains. Lots of little touches made it even nicer. Pint of milk in the fridge, teabags, coffee, sugar, biscuits, blanket for the dog, little bar of soap. The living room and kitchen area is open plan and spacious. The beds are comfortable and made up with fresh white bedding. Drive way to park in also. All white goods there washing machine, microwave, dishwasher, fridge and freezer. Also is equipped with toaster, kettle and coffee maker. Lots to do and see. We had a great time and wish we booked a longer stay. Museum is shut at this time of year but the gardens were lovely to look round. The lady manning the gate house was very friendly although she was on grandma duties so had her hands full! You stand in front of what remains of the house and wonder what it must have been like when it was being lived in. Well worth a visit. Interesting ruins, garden and a great museum. I'd like to be able to go on the ruins in future though. More of a ruined stately home than a castle, but what makes this a five star visit are the semi-wild gardens and beautiful location. Close to the sea at the southernmost point of the Isle of Skye and close to the Armadale-Mallaig ferry, it is very accessible and well worth a visit. Gardens were lovely, however we thought you were able to visit inside the castle ruins and were not made aware that you couldn't do this prior to purchasing our tickets (I had looked at the website and couldn't see anything obvious relating to lack of access). I personally found £8.50pp a lot to walk around a garden and look at the castle which you could see on Google. If we knew prior that you couldn't enter we wouldn't have made an hour detour to visit so a little disappointed.